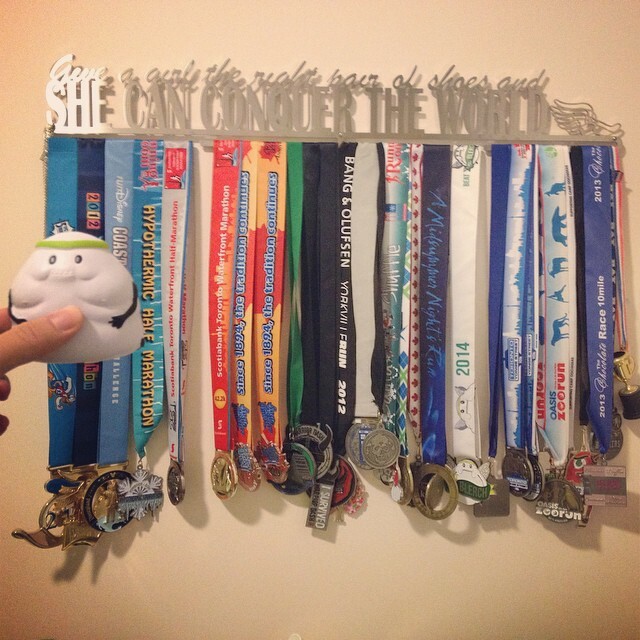 I added to my medal rack in 2014 by running 3 halfs, a 30k, a 15k, two 10ks, an 8k and two 5ks (including my friend Stephanie’s first 5k!). My buddy the Blerch also snuck into my picture. If 2013 was the year of personal bests, then 2014 was certainly the year of personal worsts. Despite all of this, I came away from my year of personal worsts feeling grateful and still having fun. I’ll explain why in a moment. To recap, I started 2014 off by running a personal worst half marathon time at the Hypo Half in Sarnia. The weather conditions were less than ideal and though I was disappointed, I was still happy to finish. This trend continued at my less than stellar Around the Bay 30k race. I had wanted redemption from my poor performance the year before but still failed to break the 4 hour mark. This was frustrating considering that I consistently ran 30k in 3:21 while training for my full marathon the year before. After this I didn’t meet my goal at the Harry’s Spring Run Off 8k race and then I was 20 seconds slower and missed breaking an hour for the third year in a row in the mainly downhill Yonge St 10k. Again this was frustrating because I’ve broken an hour in flat and even hilly 10k courses before. The trend continued with another personal worst at the Toronto Women’s Half Marathon. My first race of 2014 started out like this. An omen of things to come. While all of this was happening I was still having fun. The race atmosphere and energy continued to fuel me and as one by one my running friends became injured (Dan with his back, Kristen with her concussion and Arlene with her knee) I became increasingly grateful that I could continue to run. This gave me a new lens through which to view my year of personal worsts. While I understood that I wasn’t meeting my potential, I felt grateful and happy for every run that I did and every race that I finished. My year of personal worsts taught me a lot about what I could do (and couldn’t do due to lack of training) and gave me a lesson in mental toughness. Most importantly it reminded me to be grateful for my good health and what my body lets me do. After running a decent time at the Scotia Waterfront Half Marathon in October I knew it was time to set my sights on new goals for 2015. I wanted to crush it. I wanted redemption and I wanted to walk away from a race feeling like I’d done all of the training necessary and that I’d done everything I could to run my best possible time. I wanted to live up to my potential. “Crush it!” has been a motto for Kristen and I (along with Dan and Paul. So much so that I refer to the group that I ran my first half with as the “Crush it” gang). 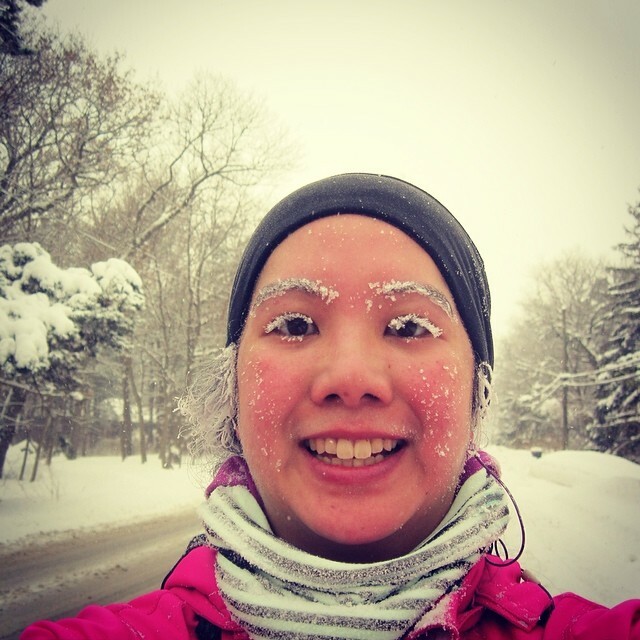 My Nike Running app crashes when I try to take a picture mid-run so I’ve started taking selfies (or “runfies”) to mark each run. 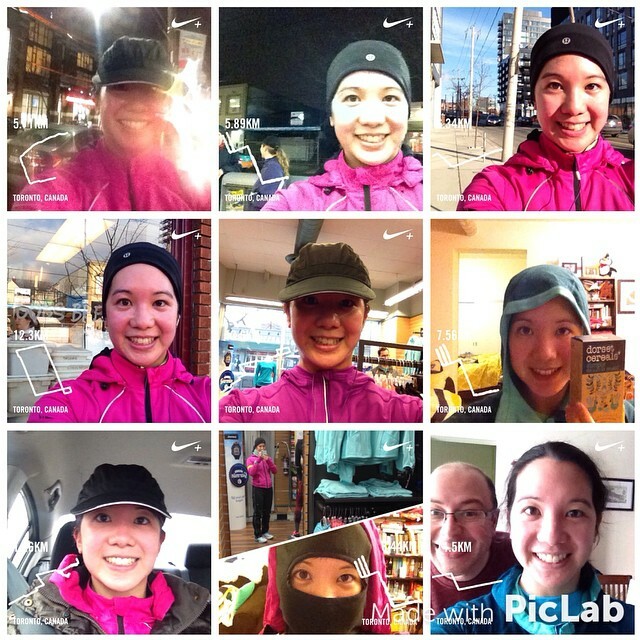 Here are some of my runfies from the last few months. The first thing I did was sign up for a Half Marathon Training Clinic through the Running Room. I’d had a good experience running with a clinic for my full marathon training and knew that a group would help keep me accountable. My objective for this was also to run consistently in the winter, which is something that I’ve failed to do over the past two years. I know that I didn’t train enough when I ran the Around the Bay 30k race last year and the year before so I swore that this year would be different. I started the training group on Nov. 4 and am happy to report that they’ve kept me accountable to run at least 3 times a week with them. They’re also a fast group that has helped push me to stretch myself and run faster. To put it into perspective, the average pace in my Nike Running app (which is approaching 2500k logged) has gone down by 5 seconds since I started running with this group. My Believe I Am Training Journal has kept me motivated, helped me reflect and also inspired me (it has lots of great quotes and exercises in it). Another thing that has helped has been tracking my runs in a running diary. 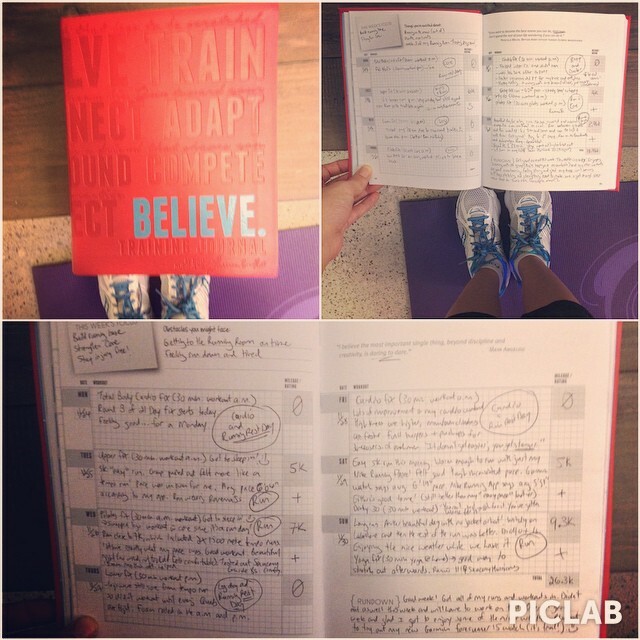 I splurged and bought myself the Believe I Am Training Journal by Lauren Fleshman and Roisin McGettigan-Dumas. The journal has given me time to reflect on each training run and think more about my goals. I’ve never kept a training journal before and have found it really useful. Every five weeks there’s also a check in section to see how you’re doing and at the beginning of each week you set your goals or reflect on what challenges there may be or strategies to help conquer these challenges. The last thing that I’ve done differently so far this year is cross training. I’ve never been very good at balancing cross training with running and I knew that if I cross trained properly that it would make me stronger overall. I’ve started cross training at least 30 minutes every day (when possible) to try to strengthen my core and arms. I’ve definitely noticed a difference! So my goals for this year are to crush it and though we’re less than a month into 2015, I’m proud to say that so far it’s working. I ran my first races over the weekend (in Bermuda!) and had a great race experience. More on that soon. Do you have any goals? What are you doing to work towards them? Thanks for sharing your great year. Good luck on 2015.